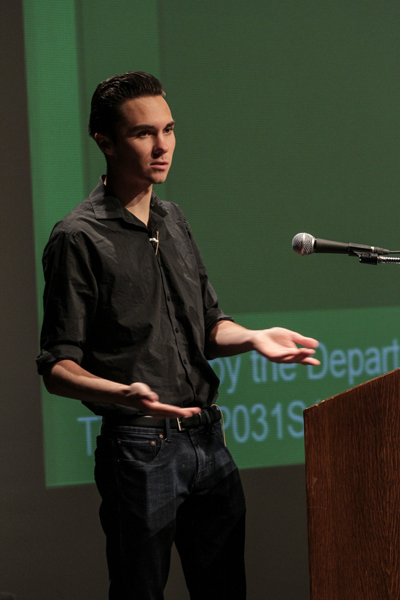 David Hogg, gun control activist and survivor of the Marjory Stoneman Douglas High School shooting in Florida last February, spoke about gun control at Brookhaven College Jan. 29. Photo by Anthony Lazon/The Et Cetera. Gun control activist David Hogg said his fight for gun control has not been an easy journey. He has been called out by name, accused of being a paid crisis actor and had difficult conversations with Second Amendment advocates, he told an audience at Brookhaven College on Jan. 29. Hogg is one of the survivors of the 2018 mass shooting at Marjory Stoneman Douglas High School in Parkland, Florida, where a lone gunman killed 17 students and employees. Following the shooting, Hogg took his experience in broadcast news classes and used it to help begin the March for Our Lives movement. The troubles for gun change come not only from the National Rifle Association, Hogg said, but also from a “racist media” institution that will not cover gun violence in minority communities the same as in white communities and politicians that “don’t care about our lives” as much as they care about being re-elected. Hogg said to fight the NRA and corporations, students should run for elected office without taking money from any special interests. “We have to go out there and run for office if we ever want to make our voice heard, if we ever want to survive the next 100 years,” Hogg said. Hogg, who said he sought out media attention following the shooting to raise awareness of gun violence, wants other young Americans to use their voices and their votes to effect change. Hogg said he does not want to take guns away from anyone who is not a domestic abuser, terrorist or a risk to themselves. But later, he said rifles are not necessary for self-defense. David Hogg, gun control activist and survivor of the Marjory Stoneman Douglas High School shooting in Florida last February, encourages the Brookhaven College community to get involved in activism, vote and run for office. Photo by Anthony Lazon/The Et Cetera. Carson Collingwood, a business major at Brookhaven, challenged Hogg’s call for more gun laws by raising questions about social contribution to gun violence. Collingwood said that in 80 percent of illegal activity involving guns, the firearm was obtained illegally. Hogg disputed this claim, saying the statistics were falsified. The last government survey of this data was conducted in 2004. The Johns Hopkins Center for Gun Policy and Research used this data and found that 31 percent of offenders who used a firearm in the commission of a crime could legally own a weapon. In the 13 states with the lightest gun ownership regulations at the time of the survey, 40 percent of guns used in a crime were obtained illegally, according to the study. Daniel Webster, director of the Johns Hopkins Center for Gun Policy and Research, told Politifact that 60 percent of crimes involving a firearm were committed using an illegally obtained firearm in the other 37 states with stricter gun laws. Another 2004 study conducted by the U.S. Secret Service and the Education Department found that 68 percent of school shooters used guns they obtained from home or relatives’ homes. More recent statistics found that the United States was home to 37,200 firearm homicides in 2016, according to the Institute for Health Metrics and Evaluation at the University of Washington. Collingwood believes that the key to curbing the number of violent crime incidents involving a gun is in fixing societal issues. She does agree that background checks are necessary but does not agree with Hogg’s hopes of banning some long rifles and certain “high capacity” magazines. David Hogg told students at Brookhaven to stand up for what they believe in and suggests starting a March for Our Lives chapter. Photo by Anthony Lazon/The Et Cetera. Hogg said that equally important to creating stricter gun laws is enforcing them. Others, like mortuary science major Mickey McMillan, were inspired by Hogg’s speech. Hogg declined to take credit for the movement. He suggested students at Brookhaven start a March for Our Lives chapter and emphasized the power of small groups of students fighting for what they believe in. Gabby Azzari, a Venezuelan international student at Brookhaven, asked how non-citizens can get involved in government. Hogg again emphasized the importance of voting, telling international students to encourage their friends to vote. 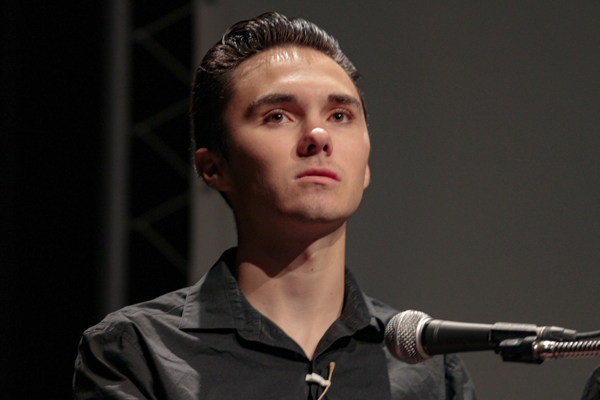 In addition to pushing for legislative change for guns, Hogg encouraged students to look to government to provide violence intervention in communities and at hospitals. Intervention could reduce the amount of gun violence by giving youth something to do other than get involved in criminal activity, he said. One example he used was a free recording studio that allowed young people to make music to express their feelings in a non-violent way. This article starts out with a deceptive description, and tailspins from there. I find no credibility here. Hogg is NOT “one of the survivors” of the 2018 mass shooting at Douglas High, and there is a sound reason that he has been “accused of being a paid crisis actor.” He was at home at the time of the shooting. Upon seeing media coverage of the shooting, he rode a bicycle to the school, after-the-fact.